This pic above shows the perfect Easter - "Peeps" racing in high heels. I would love these Peeps wearing the new Christian Louboutin stilettos designed for Barbie. 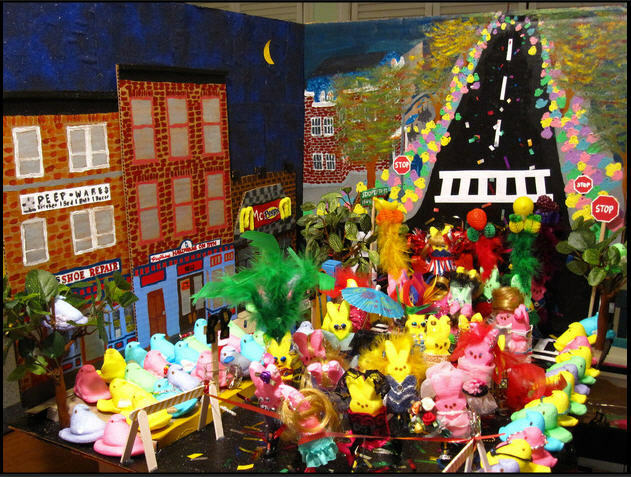 Every Easter, the Washington Post holds a contest where contestants create a diarama using Peeps (the Easter marshmellows shaped like chicks, bunnies, etc.). This diorama(seen above) was one of the semi-finalists from the Washington Post's Peep competition. Click here to vote for your favorite Peep diorama.